of Detroit. The new development will combine downtown Detroit’s first high- rise office tower in a generation with over 480 residential units. 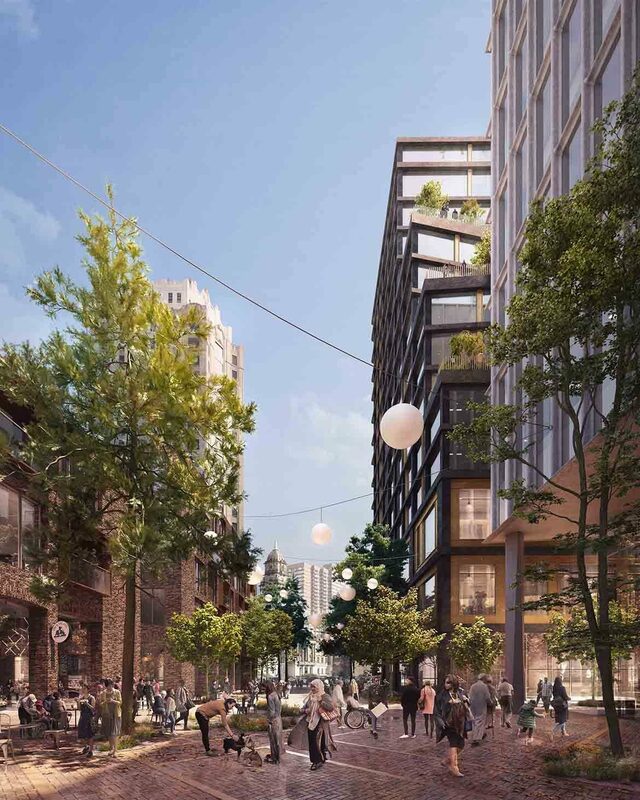 The development will re-establish historic alleyways, introducing new public plazas and green space while prioritizing the public realm both indoors and out. 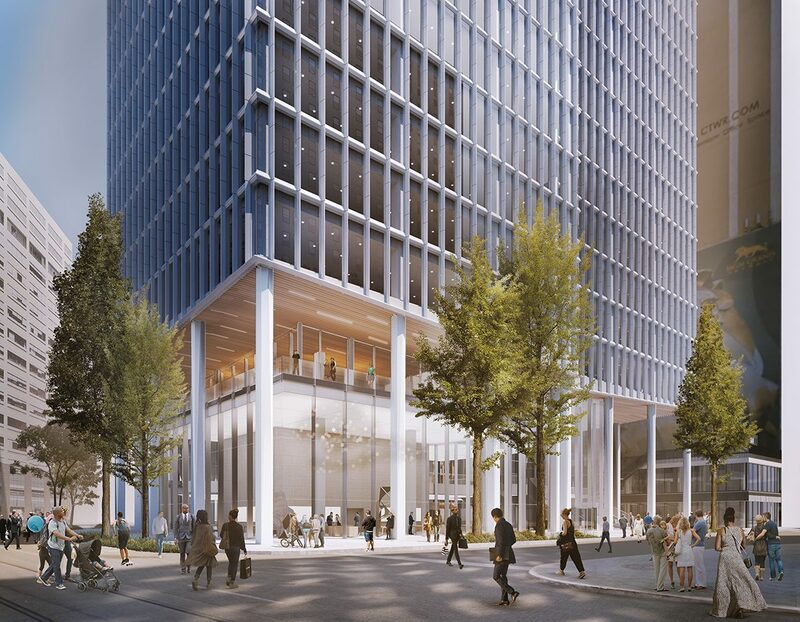 The Monroe Blocks office tower will offer a combination of large floor plates, tall ceiling heights, and access to sunlight currently unprecedented in Detroit. From Woodward’s plan of Detroit following the 1805 fire (above left) to the 1840’s map (middle) showing a dense urban downtown, the current city plan (right) shows a looser urban fabric with many empty plots. Monroe Blocks development will re-establish a missing part of downtown Detroit. 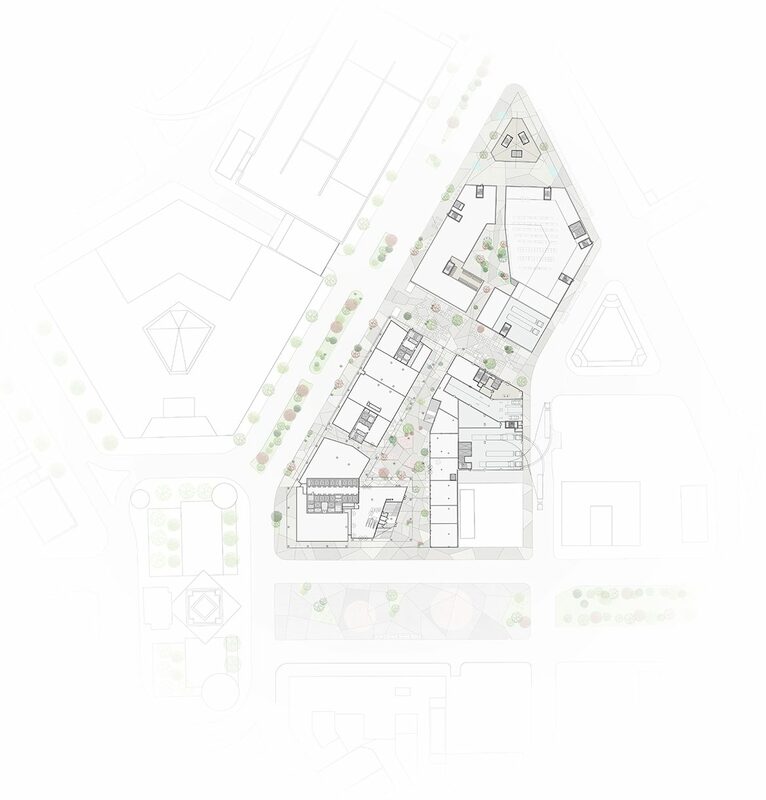 The project will aim to stitch together the urban fabric, create porosity and add green spaces to promote gathering, socializing and interaction. The site today represents a void in the center of Detroit, an important piece of the puzzle, connecting some of the city’s key central public spaces: Cadillac Square, Campus Martius, Library Square and Woodward. These new connections will not only bind the city center but also enrich, strengthen and unify the already popular public spaces. Located in a historic site, the new urban icon will be integrated into the cultural heritage of the city of Detroit. Monroe Blocks will offer a wide variety of good and accessible common spaces. Drawing people into the site will connect to the flows going across the city between Ford Field, Comerica Park and the future developments on Little Caesars Arena and its surroundings. The small side streets will become shortcuts to other destinations in the city. The building heights are adjusted to optimize the views over the surrounding city and maximize the sunlight exposure. A shimmering 35-story office tower facing Campus Martius will be backed by impressive amounts of retail, residential apartments, and new public plazas and green space. The entire project will make a diverse reflection on urban life. The mix of uses allows space for varied activities complimenting each other to make safe vibrant 24-hour public spaces. Functions include office, residential, high-street retail, grocery stores and food markets, entertainment, sport and leisure facilities and the potential for exhibition spaces and performance venues. Monroe Blocks combines high-rise and low-rise 480 residential units, full of public spaces, pedestrian walkways, and green roof top terraces.